Right now we do not have Energy dispersive X-ray microanalysis capabilities: sorry! 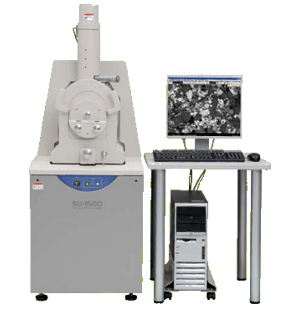 The footprint of SU-1500 has been reduced by 20% compared to Hitachi S-3000N SEM so that the microscope can be installed in more restricted places than before. To assist inexperienced users, the SU-1500 includes an on screen operating guide that walk the user step be step through the complete imaging process – from vacuum mode selection to taking a picture. This unique feature allows users of all experience levels to quickly obtain high quality images. The advanced technologies incorporated into the SU-1500 provide a guaranteed secondary electron resolution of 4.0nm (variable pressure mode). For quick observation of non-conductive samples, the SU-1500 utilizes variable pressure mode that eliminates negative charging, and provided the optimum conditions for both imaging and EDX microanalysis(**). Switchover between high and various pressure mode is completed quickly with a single click of the mouse and requires no hardware change by the user.